We unfurl a charming range of stainless steel kitchenware, which is ideal to make your daily cooking routine more comfortable and interesting. We manufacture these kitchen utensils from premium quality stainless steel, which enhances the shelf life of these products. Our team of expert quality controllers checks these kitchen items on different level of production, which ensures their impeccable quality. 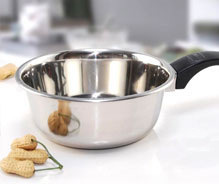 We offer the finest quality stainless steel saucepan that is ideal for sauces, stews and other cooking purposes. Its hard-anodized surface lets even heating and resists scratches and scrapes, while its becolite handle is comfortable in your hand and oven-safe. Our finest quality stainless steel steamer set is designed to allow you to cook your meat and vegetables in the traditional healthy way. The set consists of 2 steamer and a lid. 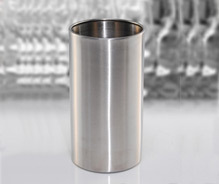 Metal exports offers the premium quality stainless steel inside beeding canister that is ideal for every kitchen. 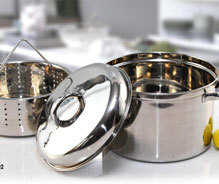 Cookware set made of highest quality stainless steel feature a mirror-polish finish that prevents food from sticking. 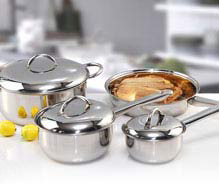 The set of cookware includes stainless steel saucepan with lid, one large fry pan and one steamer set with hollow handle. 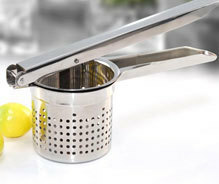 This superfine quality stainless steel potato masher is a must for contemporary kitchen be it household or restaurants. Mesh potato without touching it by hand absolutely hygienically, this masher is also easy to clean and user friendly.